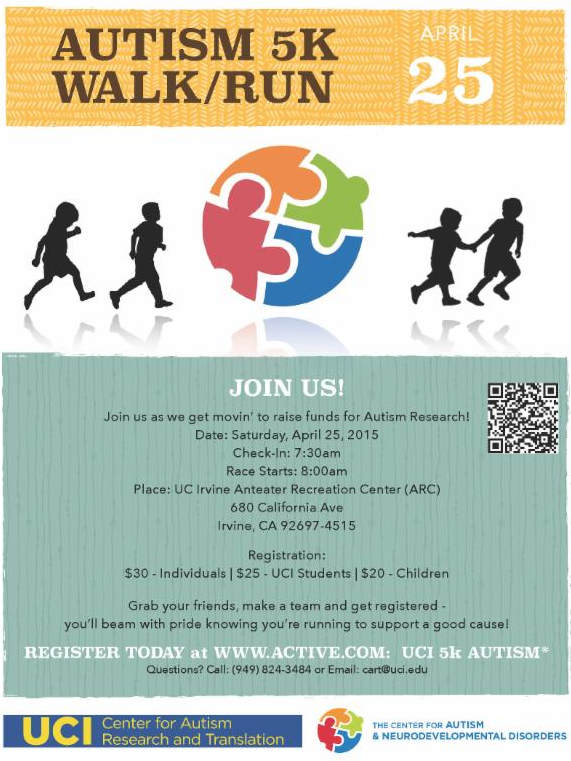 Grab your friends and get registered for the 1st Annual UCI Walk & Run to support Autism Research on Saturday, April 25, 2015 at the UCI Anteater Recreation Center (ARC). It's guaranteed to be a blast! In late 2012, in a first-of-its-kind public/private partnership, the William & Nancy Thompson Family Foundation and the Children and Families Commission of Orange County joined with UC Irvine, Chapman University, and CHOC Children’s to create the nation’s premier center for evaluation, treatment, education and research for the wide range of autism spectrum disorders. One mission of this Center is to carry out a comprehensive research and treatment effort to develop novel, effective diagnostics and treatments for autism. Over the past year, we have successfully grown and developed a team of 60 distinguished scientists of diverse backgrounds – molecular geneticists, biophysicists, neurobiologists, behaviorists, pharmacologists and clinical researchers – focusing on developing the first transformative treatment of autism. Additionally, we conduct neuroimaging, physiological and clinical research focused on improving the efficacy of traditional therapies, and exploring innovative ways to improve the lives of individuals through new knowledge, exercise and the arts. Our goal is to raise funds to support this research and provide help and hope to children and families with autism. Corporate sponsorships will be available for $5,000, $2,500, $1,000 and $500. We would love to have you as a partner in this very important fund raising event. If you have any questions, please don’t hesitate to contact Jamie Rich at 949-824-3484. Thanks in advance for your consideration. Click here to be a corporate sponsor! Can't join us? Donate to autism research! Center for Autism and Neurodevelopmental Disorders. Join us as we get movin’ to raise funds for Autism Research! February already! Christmas has come and gone now, and time to get back outside to have some fun! In addition to our fun runs, we do ride as well. Check out our calendar page and RSVP if you ever want to have a nice ride with us. There are a few of us doing the Solvang Century ride again to gear up for the year. Its a ton of fun, and a great get-a-way! I have a few more rooms at Hotel Corque (host hotel) reserved if you were thinking of going, just give me a call. 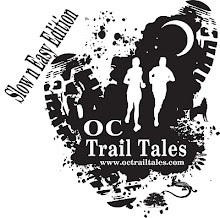 Consider Solvang Century for part of your training this year, and join us for some fun! Ramp up for the challenge of our 50 mile, metric, or 100 mile ride.